By C. Eugene Emery Jr. on Wednesday, June 25th, 2014 at 1:21 p.m. The Truth-O-Meter is turning 4. Have a slice to celebrate! Four years ago today -- June 25, 2010 -- PolitiFact Rhode Island published its first Truth-O-Meter rulings. Political discourse in the state hasn't been the same since. We constantly see politicians and other public figures hesitating when they speak, expressing concern that they will be fact-checked. It has made some -- but not all -- take more care in the facts they present to support their arguments, improving the level of political discourse in the state. You're free to browse them all. One thing we love about PolitiFact is the ability to search through all of our items and discover which lies never die, even if different people are telling them. 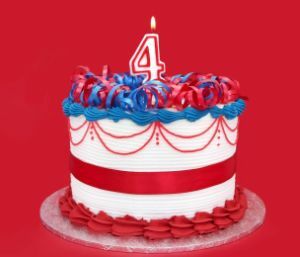 So today we're lighting a match to ignite four birthday candles, and not someone's pants. Researchers: C. Eugene Emery Jr.